What has been the most financially disruptive event of this century? No more need be said… we all know exactly what “2008” means. It was a year filled with trauma, stress, and anxiety. During the 2008 financial crisis, more than eight million Americans lost their homes. Another 10 million lost their jobs. And the S&P 500 cratered 56%. As you know the source of all this was a collapse in US housing. Between 2006 and 2009 the average home lost over a quarter of its value. This shocked millions of folks who believed the lie that US housing was a slam-dunk, can’t-lose investment. The fallout scarred a whole generation of Americans. Did you see the bloodbath in US homebuilding stocks last year? They were obliterated, having their worst year since 2008. This was no run-of-the-mill correction. In 2018, homebuilder stocks plunged as much as they had during the first 12 months of the 2008 housing collapse! But I’m going to explain why it’s a big moneymaking opportunity for us. We’re going to buy a company that’s earning record profits… while trading at its cheapest valuation since the depths of the housing crisis in 2009. It’s the kind of safe but lucrative opportunity you only find in the wake of massive disruption. Mortgage rates spiked to their highest level since 2011. Trump’s new tax law removed some of the tax incentives for owning a home. And after hitting a 10-year high in November 2017, home sales fell. US homes are still very affordable. To measure affordability, let’s look at the National Association of Realtors affordability index. It takes three key metrics—home prices, mortgage rates, and wages—and boils them down into a single number. This number represents how affordable housing is for the average American. 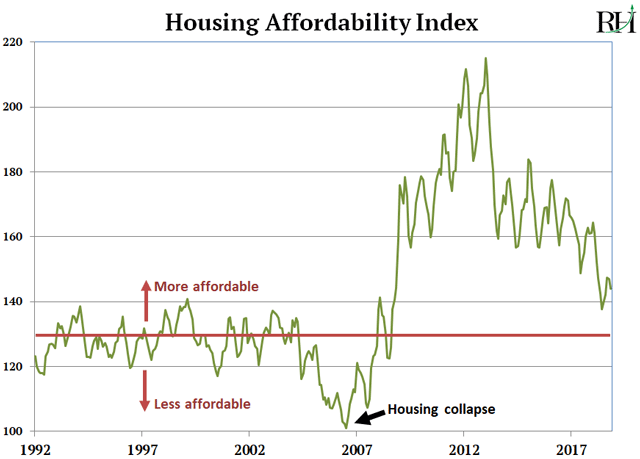 You can see affordability has dipped from generational highs in the past few years. But it’s still well above the 50-year average as shown by the red line. Over the past half century, the affordability index has averaged 127. Today it’s at 145. Outside of the past six years, that’s the highest reading since 1971! You see, every housing bust in the past 50 years has happened when affordability was below 120. Put another way… there’s no evidence that investors should be fleeing homebuilder stocks. The huge selloff is not justified. Look, the 2008 housing bust was the mother of all disruptions. Investors lost their shirts in homebuilding stocks. Had you invested $10,000 in homebuilder ETF ITB in 2006, you’d be left with just $1,300 in 2009. That’s a painful memory. I understand why investors are skittish. But the fact is the risk of a housing bust today is virtually zero. 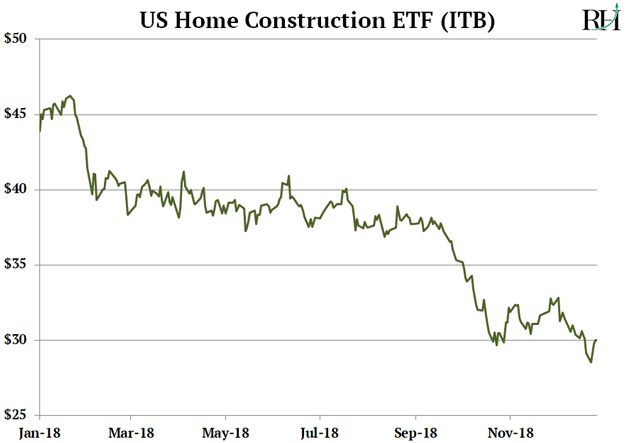 Yet many homebuilder stocks are trading at crisis prices! We’re picking through the rubble to buy America’s top homebuilder: NVR, Inc. (NVR). Yet its stock is trading at just 13-times earnings… its cheapest level since 2009. That’s a combination you rarely see outside of a crisis. Under the hood, NVR is an exceptional company with a unique business model. You see, most homebuilders buy raw land then build houses on it. This is risky. The company must first pay up-front to own the land. Then it will plow money into developing the land… and then finally into building the houses. This can take a long, long time. Most homebuilders must pump in vast sums of money for years before they see even a penny of return. Even worse, they hold the land on their books the entire time. Imagine buying land in 2004 when the housing market was booming? You would have paid through the nose. And by the time you finished developing it years later, the market had tanked. NVR never buys raw land. It only buys developed land. This is unique among homebuilders. It means NVR avoids the riskiest part of the business. It’s why NVR was the only homebuilder to turn a profit every year from 2006 to 2011. Think about that… even in the worst housing downturn ever, NVR still managed to turn a profit. Today NVR is far more profitable than its rivals. Its net profit margin is almost double the industry average. Meaning for every dollar of sales, NVR shareholders see twice as much profit. This all makes NVR a very safe investment. And because it plunged 43% last year, there’s plenty of upside. I see NVR climbing 50% in the next 12 to 18 months as it makes a run back to its recent highs. Are homes selling fast in your neighborhood? Tell me at Stephen@riskhedge.com. ETFs Have Revolutionized Investing… Are You Missing Out? 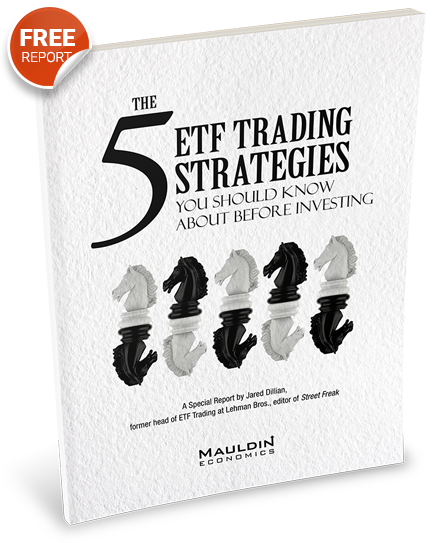 Get started with The 5 ETF Trading Strategies You Should Know About Before Investing. Subscribe to The 10th Man, Jared Dillian's free weekly newsletter.